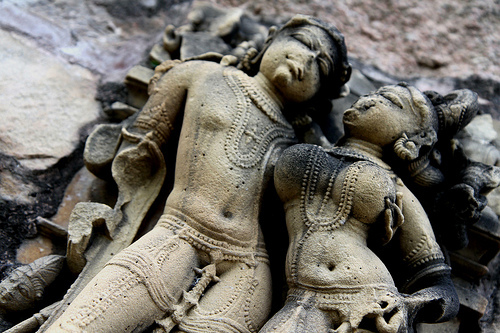 Many have debated over the importance and relevance of the curvaceous nymphs carved into the walls of Indian temples along with passionate scenes of love-making straight out of the pages of the famed Kamasutra. The reasons could be many; different experts have different views on this subject. The most common belief, though, is that the temples were carved to depict everything about human life – from wars that people fought at that time to routine daily chores and to, of course, the act of procreation. Increasing the race was highly encouraged and considered an act of celebration, which is also probably why it was joyously depicted in the sculptures. Moreover, it cannot be denied that these are also a celebration of the human form, particularly the female form, apparent in the hundreds of full-figured, graceful apsaras that adorn the temple walls. Nowhere are these sculptures more beautifully carved and depicted than on the temple walls of Khajuraho, which is an UNESCO World Heritage site. Built over a span of 200 years between 950 AD and 1150 AD, these magical monuments in sandstone are the epitome of India’s sensuous history. Here the wonderfully joyful and well-endowed nymphs are showcased going about their daily life with music and dance, sometimes putting on make-up or simply admiring themselves in a mirror. Images of couples in amorous embraces called Mithunas are particularly striking in their gracefulness and explicitness. 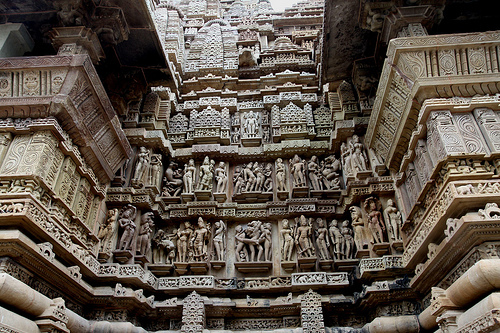 Each temple houses hundreds of these beautiful sculptures, which are a veritable feast to the eyes. A visit to Khajuraho, therefore, is highly recommended to those who wish to experience the perfect blend of artistry on stone with aesthetic sensuality. Hi there. good article. But in fact, evolution is a process that applies to everything everywhere. Evolved civilizations are merely those that have adapted successfully to environmental changes. WHY have some civilizations and their artifacts survived/been preserved and continued to be mined for learning while others have not?